Johnny has lived in the Waco area for 45 years and currently lives in China Spring with his wife Michelle, his daughter Abbie, and two sons Cayden and Ian. Johnny has a background in product design for manufacturing and processes. He brings 27 years of experience in those areas. Johnny has had a passion for residential remodeling for many years and has undertaken many remodeling projects since 2002. 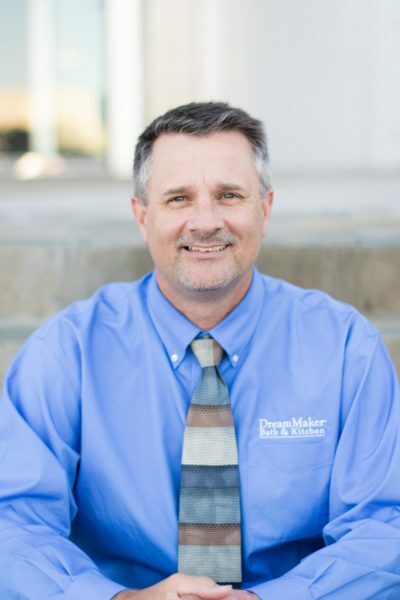 He became a DreamMaker Bath & Kitchen franchisee in 2016 after searching for the best way to offer kitchen and bath remodeling to homeowners. DreamMaker offered the processes and product selection to help homeowners realize their remodeling dreams. He is excited to have opened the DreamMaker Design Studio located at 4710 West Waco Drive. The Design Studio helps homeowners understand the various options of designs and product selections for kitchens and bathrooms. When not at work, Johnny loves bass fishing. He has won several awards including Angler of the Year in 1995, and even won the 2006 Texas state fishing BassChamps. He loves spending time with his family and is active in the community. Johnny has coached several select teams in basketball and baseball and enjoys spending time with the kids and seeing them develop their skills.